The Reception and Study Center for Children strives to create an alternative home and family to children 0-6 years old who are abandoned, dependent, neglected and abused. It plans and arranges for the appropriate placement of the children such as reintegration with the family, foster care, domestic and inter-country adoption, and residential care. Through the consistent and regular support of a generous Japanese couple, Mr. & Mrs. Tatsuo Uchida, the Reception and Study Center for Children was constructed in a 1,231 sq. meter lot within the vicinity of the Davao Medical Center. Abandoned children in the hospitals and in the community should be referred directly or indirectly to Reception and Study Center for Children (RSCC) with complete documents such as CSR ; Original Birth Certificate, medical certificate and referral letter. Hospital must have a referral letter, police blotter, and medical certificate and child study. Whole body picture of the child upon admission including the referring parties. Counseling should be done by the Center Social Worker focusing on mother’s decision to waive her parental authority. Center Social Worker will explain the implication of the Deed of Voluntary Commitment (DVC) that the mother or parents had signed notarized by a lawyer. b.1.) For a legitimate child, both the natural parents must sign the Deed of Voluntary Commitment duly notarized by a lawyer. b.2.) In the event of death of parent, a true copy of the Death Certificate should be submitted to Reception and Study Center for Children (RSCC). Original copy of Child’s Birth Certificate. Whole body picture of the child. Case Study Report of referring Social Worker. 1. Social Service – are intervention that seek to restore / develop social functioning of children from admission to discharge and preparation for family reunification, community re-integration and alternative parental care. c. Family counseling shall also be given to natural parents and guardians of children of the center during visit. 2. Homelife Services – The center shall endeavor to provide the children with a pleasant atmosphere that shall approximate as nearly as possible the conditions of a Home. The staffs of the center are all responsible for providing parental love, attention, care, and other homelife needs of the children. 3. Health Services – Health services include provision of preventive and curative interventions to promote health and to reduce and prevent diseases and morbidity. These are the conduct of routine physical examinations, immunizations, deworming, growth monitoring, vitamins, supplementations, environmental health and sanitation in patient care and physical therapy. 4. Educational Services – The center provides educational services based on the capacity and needs of the children. 5. 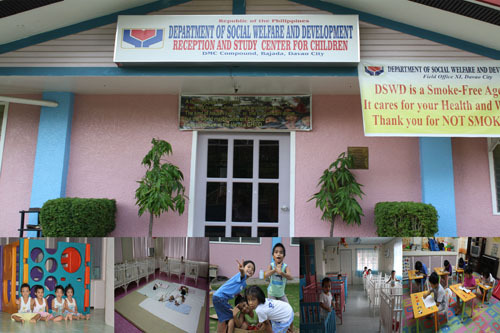 Training Services The Reception and Study Center for Children (RSCC) shall also serve for social work students and other related discipline subject Government Rules an Affiliate/ Apprenticeship.